Notable attendees including R&B star John Legend and "Homeland" actor Damian Lewis. 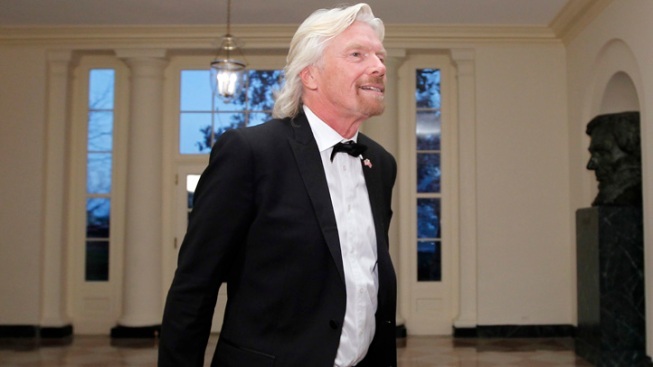 Sir Richard Branson arrives at Wednesday's White House State Dinner, where he was one among scores of top names in entertainment and media. Wednesday's giant state dinner for British Prime Minister David Cameron and his wife — the biggest ever thrown by Barack and Michelle Obama — dished up a potent mix of celebrity glam, corporate heft and political money under a giant party tent on the South Lawn. It is an election year, after all. The entertainment lineup also included a little something special for both couples: The Obamas are big admirers of Grammy-winner John Legend, and David and Samantha Cameron are huge fans of Mumford & Sons, a British folk rock band also performing. Obama, for his part, also is a big fan of "Homeland" actor Damian Lewis, who said on his way in that he planned to ask the president how he ever finds time to watch TV. Among the 360 people who scored golden tickets to the dinner were actor George Clooney, billionaire Warren Buffett, Supreme Court Justice Antonin Scalia, businessman Richard Branson, Apple's Jony Ive and movie mogul Harvey Weinstein, a big fundraiser for Obama's re-election campaign. In fact, more than 30 of the biggest financial backers of Obama's bid for a second term made the cut, according to an Associated Press review of the guest list. Others who made the list: Hugh Bonneville and Elizabeth McGovern, both of "Downton Abbey" fame, and Rory McIlroy, the new world No. 1 golfer. In advance of the big night, the 22-year-old from Northern Ireland was so excited he tweeted a photo of himself being fitted for his dinner suit. One anticipated guest — at least by the Camerons — was just not to be, a possible mix-up caused by what George Bernard Shaw called two nations separated by a common language. David Cameron revealed at a luncheon that his wife was thrilled to learn that her favorite movie star was coming. "I said, 'Is it Ben Kingsley from 'Gandhi' or Peter O'Toole from 'Lawrence of Arabia?'" Cameron said. "No, it's Chevy Chase from 'Caddyshack,'" Cameron said his wife had told him. But it turned out the only Chevy Chase on the invitation list was the Washington suburb of Chevy Chase, Md. — the home address of one invitee. Apparently, a memo went out that blues were the color of the night. Both first ladies and a healthy share of their guests turned up in the color. Mrs. Obama wore Marchesa, to the delight of Weinstein and his wife, Georgina Chapman, the designer of the first lady's gown. Both pronounced themselves surprised when reporters told them what the first lady was wearing. "I'm knocked out," Weinstein enthused. Obama gave the Camerons a sartorial thumbs-up as they arrived, declaring, "They look better than us." During his dinner toast, Cameron complimented both wives while joking about his Tuesday night out with Obama at a college basketball game in Ohio. "We have to have a guys' night out because so often we find we are completely overshadowed by our beautiful wives," the prime minister said. The White House made sure to save a seat at the table for more than 30 of Obama's top fundraisers — the so-called bundlers who each have helped raise at least $50,000 for the president's re-election effort. A number of coveted seats went to supporters who have raised between $200,000 and $500,000 for Obama, and at least nine went to donors who have raised more than a half-million dollars for his campaign, according to the AP review. They include Weinstein, New York financier Orin Kramer and Miami public policy consultant Joseph Falk. Kramer and Falk also have given more than $10,000 apiece to Priorities USA Action, a "super" political action committee supporting Obama's re-election bid. Priorities has struggled to raise the kind of big cash flowing to super PACs supporting Republican candidates, although Obama recently encouraged his supporters to donate to the group. The Obama campaign said it had no comment on the donor-heavy guest list. Big names sat at the head table, Clooney included. But also Elaine Brye, an Winona, Ohio, mother of four children serving in the military. Mrs. Obama invited Brye after she wrote to the first lady about her campaign to support military families. After passing through the White house, guests had the option of walking or taking a trolley to the tent on the South Lawn. And this was no ordinary party tent: The giant structure featured a 150-foot-wide glass wall overlooking the White House grounds. Even the rich and famous feel the "wow" factor of a state dinner: Actor Idris Elba said it was like visiting Disney World, where "you don't know what to expect next." British Olympic gold medalist Denise Lewis pronounced herself as giddy as a schoolgirl. Richard Branson, who arrived sans spouse, said his wife was "very jealous" to miss it. Weinstein, a state dinner veteran, said he was thrilled to attend — and thrilled that Obama's seeking re-election. His only complaint about the president: "He's too humble." The man needs to talk up his accomplishments more, Weinstein counseled. The entire menu was a U.K.-U.S. blend, featuring bison Wellington, using buffalo tenderloin from North Dakota instead of beef. It also included crisped halibut served on braised baby kale from the White House garden. The salad greens, too, came from the White House backyard. During an afternoon preview event, Mrs. Obama told schoolgirls from the U.S. and the U.K. that the dinner emerges from a "little-bitty kitchen," but that the chefs would have a little extra elbow room Wednesday with the dinner taking place outside. One tidbit that didn't appear on the extremely detailed menu: the specifics of the "American wine" selections. Without explanation, the White House stopped listing the wines after catching criticism for serving some pricey bottles at earlier state dinners. Executive chef Cristeta Comerford told the schoolgirls that the garden was a big inspiration for the evening's menu. "It just came from the backyard, which is kind of cool," she said. It was one more way to find common ground with the Camerons, who have their own vegetable patch at the official 10 Downing St. residence. The meal was all about fostering that oft-spoken-of "special relationship" between the U.S. and Britain. And so while the prime minister is not a head of state, making this an "official visit" rather than a "state visit" by the Camerons, the Obamas nonetheless chose to call it a "state dinner," with all of the attendant ceremony and pomp.